It's so hard to resist buying new makeup, especially if you consider yourself as a beauty enthusiast. I’ve told myself time and time again that I don’t need to buy a new lipstick or blush, but that didn't stop me from testing out these beauties. Heck, I've even strongly written it down on my NY’s resolution that I'm only repurchasing makeup that I've already used up, but nothing happened (LOL!). With so many brands and products in the market, it’s difficult not to get enticed with the new product offerings, especially when they are being so raved about by your favorite beauty vloggers. 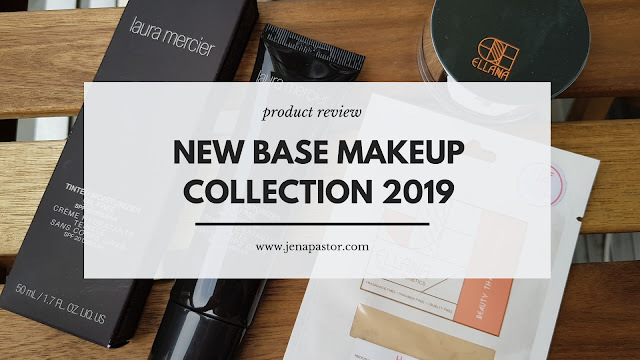 In the past year, I’ve collected a total of 33 42 new makeup which I think will be my go-to essentials for 2019. 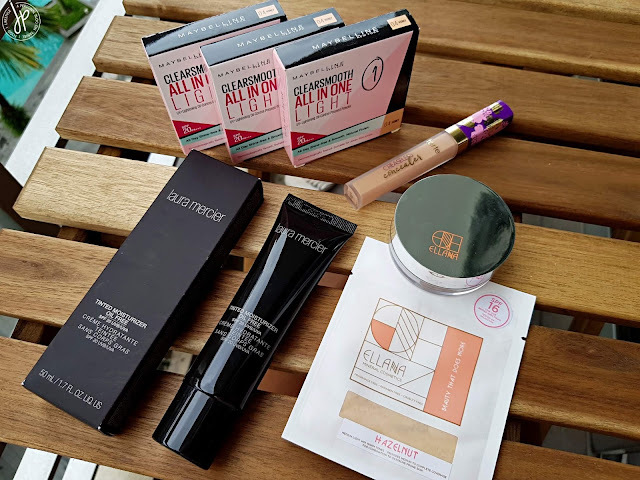 From drugstore and Philippine local brands to high-end products, I’m giving a rundown of my new collection, beginning with base makeup! This is my everyday, base makeup for more than a year now. It claims to be a UV+Lightening powder (which I’m not sure if it does the job), but for only Php 169-199, it’s an affordable product that does oil control for about 4 hours. It has SPF 20 PA+++ which I find helpful because I don’t wear sunscreen as the cream-based product usually clogs my pores. I’m in the shade 04 Honey, which is the darkest shade available (but still not dark enough for those with deeper morena skin tone). I usually buy 3-5 pieces of this when I go home in the Philippines because the regular price costs SGD 15.90 in Singapore (on sale at SGD 12.90). Since using this product, my skin has improved a lot, compared to daily application of liquid foundation. I knew the brand Ellana a decade ago and I remembered buying their loose powder blush and the softest angled brush that's touched my cheeks. Recently, many beauty vloggers have been talking about the brand’s mineral loose powder foundation and how it effectively applies and stays put on oily skin. As a Christmas wish list, I bought this the last time I went home and I was matched with the shade Hazelnut, perfect for those with warm, light medium skin tone. I must say this product really looks natural, although this only stays on me for about 6 hours without blotting. Still, I love this product and I’m thinking of purchasing another refill on my next visit. The powder foundation itself costs Php 499, while the jar container is worth Php 199. I was looking around Sephora in Suntec City when I came across this product. I haven’t used a tinted moisturizer before, so I asked for this as a Christmas present. 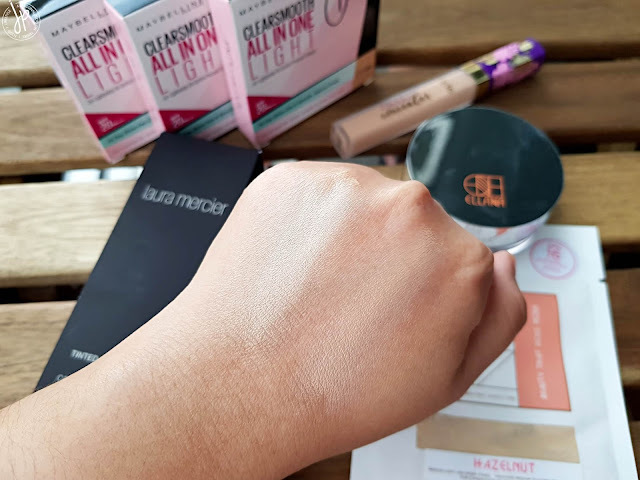 As the product claims, it is a sheer tinted moisturizer with a demi-matte finish, perfect for those who want a no-makeup to a light makeup look. It’s best applied with fingers than any other tools, which makes using it less of a hassle. To be honest, this one does provide a demi-matte finish for a couple of hours. It made my skin look healthy, but since it’s a sheer coverage, it didn’t cover any blemishes or dark circles. It looks promising when I swatched it at the back of my hand, but it feels like a regular moisturizer when applied to the face. This does nothing in terms of coverage. Even though this won't be my go-to base for everyday wear, I’ll give this one another try. After all, it costs so much for SGD 77! I’m in the shade 2W3 Natural. 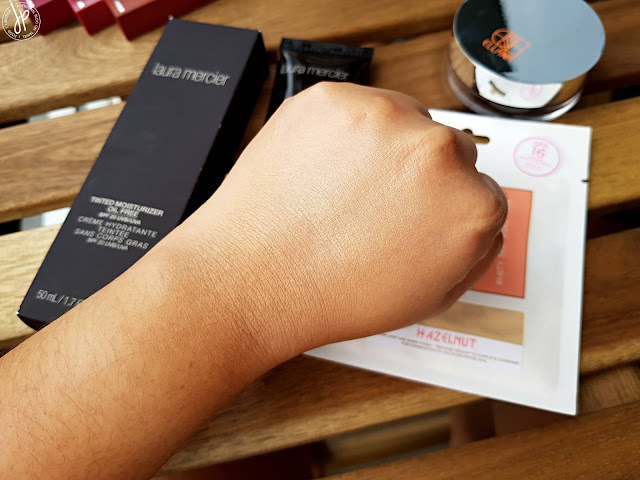 Laura Mercier oil free tinted moisturizer in 2W3 Natural when blended at the back of my hand. Not really visible after blending. This works effectively on people with almost clear skin and no visible pores. When I left my holy grail Tarte Shape Tape concealer in Manila, I spent 15 minutes in MAC Cosmetics and two hours in Sephora trying out various concealers from brands such as It Cosmetics, Kat Von D, and NARS. At that time, Shape Tape and Fenty concealers weren’t available yet in Singapore and I didn’t have a back-up of my Shape Tape with me. Tarte’s Creaseless Concealer was my best bet. I was matched with the shade 34H Medium Honey, which I felt was too light for me at first. But then, the beauty consultant said it was the right shade for my skin tone as this product oxidizes. And it did. For those who like a more healthy, dewy look without looking too oily, this is your go-to concealer. You only need the tiniest amount and best applied with your fingertips to thin out the consistency. Tarte's Creaseless Concealer costs SGD 40. When blended: Tarte Shape Tape on the left (35N Medium) and Tarte Creaseless Concealer on the right (34H Medium Honey). Notice that the Creaseless Concealer oxidized just after 2 minutes. As soon as Sephora Singapore announced they’ll be carrying my holy grail concealer, I immediately ordered online for my second back up of Tarte Shape Tape in the shade 35N Medium. This shade is intended for medium skin with neutral undertones. 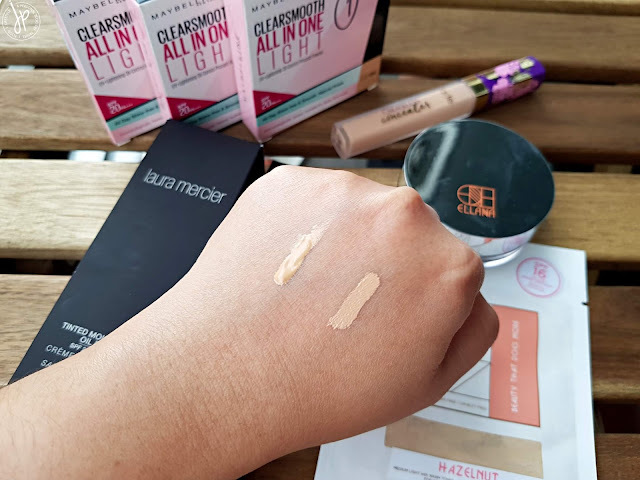 Although I think the shade 34S Medium Sand will also work on me (as it is made for medium skin with yellow undertones), I feel like it’s going to be too light, as this concealer does not oxidize that much compared to the Creaseless one. I love Shape Tape so much, that I use it every single day when I go to work and when I go out on weekends. In Sephora Singapore, a tube costs SGD 42. 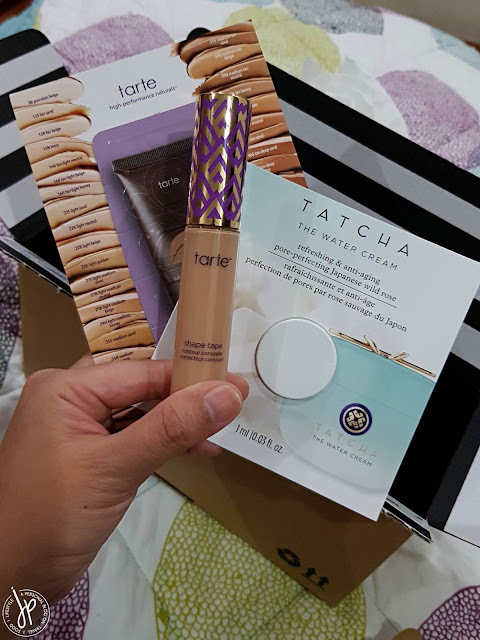 My online purchase from Sephora Singapore (Tarte Shape Tape Concealer), together with Tatcha Water Cream and Tarte Amazonian Clay foundation samples. My new makeup base collection is so simple. As you can see, I didn’t purchase any new primer or liquid foundation, simply because I don’t use them everyday. Next up, I’ll be sharing with you my new face makeup collection.